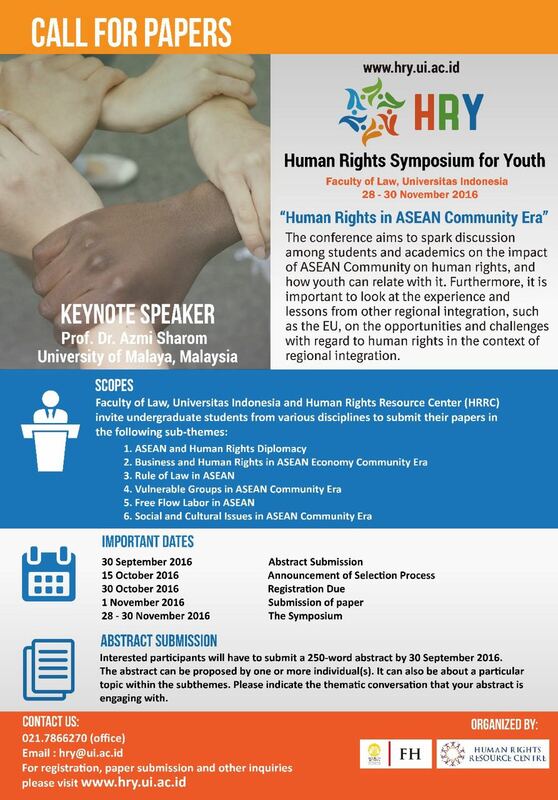 The Faculty of Law, Universitas Indonesia, in collaboration with the HRRC, will be hosting the Human Rights Symposium for Youth: “Human Rights in the ASEAN Community Era” on 28-30 November 2016 at the University of Indonesia, Depok Campus. The conference will aim to spark discussions among students and academics on the impact of ASEAN Community on human rights, particularly its implications on the youth. Furthermore, the conference will act as a platform for reviewing experiences and lessons learned from other regional integration efforts, such as the EU and brings questions such as what are the opportunities in the more integrated region, what are the challenges in the perspective of human rights? Limited scholarships are available for selected participants. Please view the dedicated webpage of Universitas Indonesia for more information about the Symposium, including on how to register. Inquiries may be emailed to hry@ui.ac.id. ASEAN, Business & Human Rights, Events, Indonesia, Rule of Law, Vulnerable Groups. permalink.